I write, run, travel, fast-clap, repeat. I write about and research inspiring, creative women and men who make this world a better place. I find joy in the simple things. Coffee is my fuel. A promised beer at the end of a race is reason enough for me to run. I like games, lists, being on teams (I once played on a dodgeball team that threw 90mph. Now seeking a kickball team), community (read: November Project), athletic pursuits and soaking in the Vitamin-D sunshine with SPF100. I enjoy dropping myself in front of any dog that passes in my path. I sing the correct lyrics to all of the songs while my sister increases the car stereo volume. I don’t talk about fashion because I am far from qualified. I live in athleisure and attempt to make simple meals and have successfully discovered how to keep houseplants (“Plant” is his name, and he is delightful) alive. “Alright, let’s do it,” he said to me as he grabbed the first writing material he could find. He scribbled numbers, times and dates in pen and slid the napkin across to me. That was my first marathon training plan. It all started in a Harvard Square bar with two beers, the recent half marathon finish glow, and a training plan written on a napkin by my long-time friend Coach Eugenio. With four marathons and a handful of other races under my belt since then, I’m curious to see what else the world has to offer and am off to new explorations like hiking, globe trotting, yoga, and especially moments that include napkins at washed up bars. These posts take you on my course, sometimes winding, always hilly and often reflective of looking for those inner moments that fuel us to race the race set before us with endurance. It was in Boston that I discovered the world of endurance. 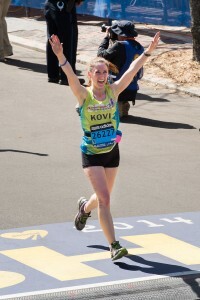 In 2013, I ran my first Boston Marathon as part of the Dana-Farber team and raised funds for cancer research. I ran two more years with Dana-Farber, and started this blog. My first look at long distance running started when my friend Eugenio trained me for my first marathon in Connecticut. We finished in 3:59:09. I say we, because I could not have done it without him. The Boston Marathon, though, still remains my favorite race partly for its history, partly for its brutal course and climate, but mostly for its abundant energy. It was the first marathon I ever saw. I watched at the finish line in awe as groups of runners, beaten and determined, ran 26.2 miles into the city. It was a feat I was so taken by. Boston will demand the best of you, but will support you with every shouting fan along the whole course at every mile. Since that time, I’ve grown to write about cooking (a new and comical entrance into the world of food), travel, and anything that inspires me that I hope inspires you to dive into the unexpected ocean of life and figure out what makes you happy. I grew up with a family that not only valued giving back to our community, but practiced it daily. Volunteering was an activity I learned at a young age and one that still feeds my soul. These non-profits are ones I have personally been a part of and am proud to support. The San Diego Humane Society and ASPCA has adoption programs, education programs, community programs, animal safety programs and youth programs to create a more humane world. They do this by inspiring compassion, providing hope and advancing the welfare of animals and people. Dana-Farber Cancer Institute is a renowned research facility in the New England area. The Dana-Farber Marathon Challenge Team (DFMC) was started to raise funds for basic cancer research. 100% of the proceeds go to the Claudia Adams Barr Program, which provides funding for projects often overlooked by government funding.